Hi, I’m Joe and I’m a young musician from Nottingham. 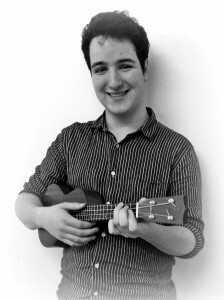 I have studied percussion for close to ten years now, and I also sing and play guitar and ukulele. I have worked in a wide variety of professional and community music environments including live theatre and even a french circus! I currently work as an apprentice with Nottingham Music Hub, teaching young people on a daily basis and organising projects for young people in Nottingham City. My experience so far with Opus Music has been overwhelmingly positive. The warm welcome from hospital staff has been brilliant, as has the welcome from patients on the wards. Alongside this I have had the opportunity to work with some fantastic musicians and above all, friendly people. The tactful approach to the sensitive nature of this type of music making has been very tricky to master and I’m aware that I’m not there yet, but the training process has felt relaxed and safe and I feel like this has facilitated quick learning. One of the fantastic things about Opus is that there is absolutely no pretence and no ego. All of the musicians I have met have only had one aim, and that is to improve other people’s quality of life. This is such an anomaly in the professional music world that it really takes you by surprise. The selfless nature of the practitioners of this work is astounding, and something I hope to mirror in the way I engage with not only this work, but in my wider engagement with community and professional music. I feel like this attitude may have evolved out of the environment in which we are working. In the hospital a tireless and dedicated medical team who show genuine care and empathy towards their patients surrounds you. This can only have a positive impact on the way that we work as musicians. All that said, the real treasure and reward from this training lies not with personal development or heightened musical ability or awareness; it lies with the people that we meet. Engaging with a broad spectrum of complex, intricate people with a variety of different needs has shown me another aspect of the multi-faceted benefits of music. I am meeting people I would never meet in my day-to-day life, and making music with them and this can only be a positive thing.